Highly responsive Automotive Website Templates are considered to be the best website layout for any type of car dealers, car rental service or repairing, car clean service, car magazine and more related to automotive services. 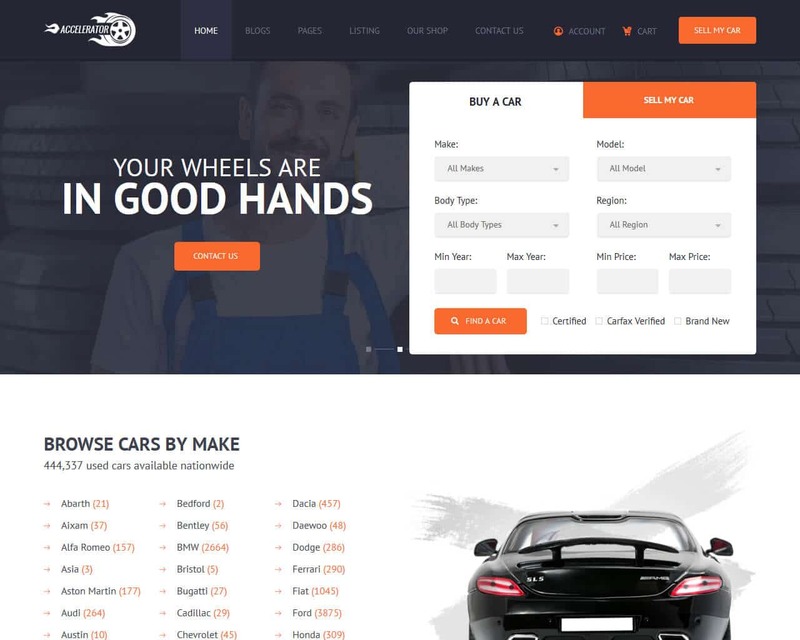 These templates are designed to give them with a fair chance to design a website for their automotive services with quick car reservation tab, build-in booking form and more. Each Automobile Website Design template is customizable and hence it gives them the freedom to choose the final design for the website, making it follow the branding with ease and even helping the website to reach wider customer base that are loyal. The Car Website Templates also add a new shine to the overall website of your car service. You will notice that business is flourishing at a rapid pace and even expanding its horizon beyond one’s expectations with very minimal efforts. By using the pre-design templates you can also save the money which you would spend when hiring coders or designers to bring the professional look to the website. These templates will do all the hard work for you and even put it work and turn your website highly functional in all means. Designing a website for your car service company is way simpler than you think. You are not always required to spend huge sum of money and get involved in the complicated process of hiring someone which specializes in it. With the pre-design Car Dealer Website Template you can easily complete it with some light editing. So, make use of this pre-design Auto Repair Website Template online for designing the car business website with ease. When there are lots of car wash website templates out there, you can be lost among of them. This very template is crafted to promote your car-washing facility at its best. You do not need to be a coding genius in order to build a website. Both technical and non-technical people are able to create a lovable online-project. Together with a super-responsive design, your website will work perfectly on all possible devices. Thanks to a multitude of Google Fonts, your texts will immediately catch the eye of the visitors. In order to make messaging easier, take advantage of the Ajax Contact Form. It makes certain that people can rely upon your professional services and team. This wonderful template has even more options that can enforce your next website. 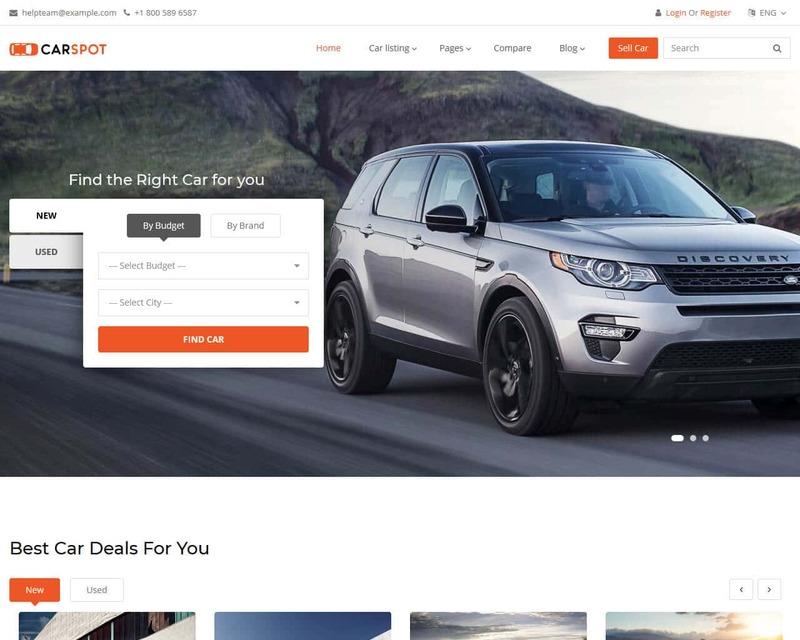 Carspot is the online, highly featured car dealership and automotive website template which is creative, modern and multitasking template for your website designing needs. The Carspot templates are creatively designed using the modern framework that works both on mobile and desktop and it is highly responsive templates that suit your car industry website needs. Each of the html file of templates are well designed and commented which guarantees easily understanding of the code. Most of the templates designed by Carspot are having the premium template feature which a dealer definitely needs for designing a website and the templates are easily customizable for your needs. You can also do light editing to the templates online to add more forms and options that can help your business to buy, sell and rent out any kind of vehicles online. From adding grid or list view of car listing to simple dropdown navigation, there are many other features that you can add with editing to the templates to achieve the final design template for your website designing. 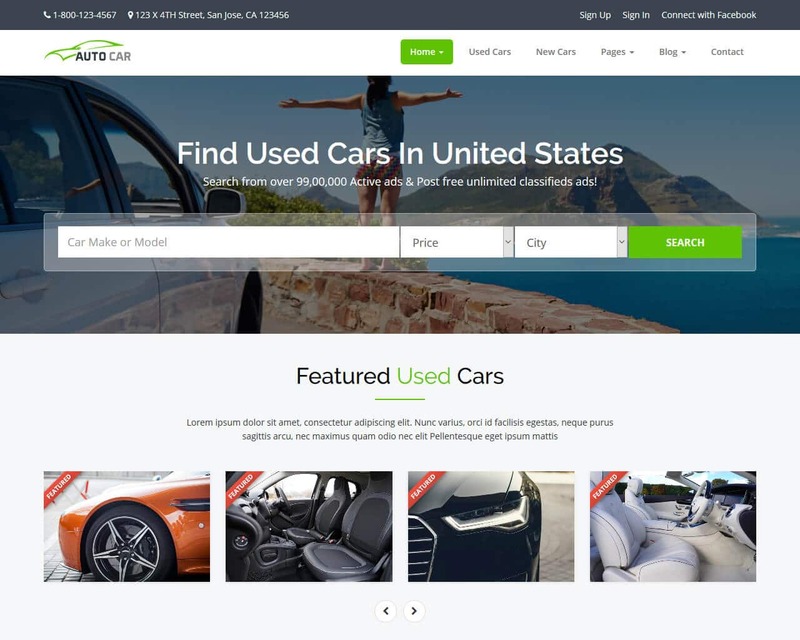 Auto Market is another renowned and popularly used template that is extremely focused towpaths marketplace that produces cars and offer related car services. All the templates are highly responsive and work both on mobile and desktop for your convenience and these templates are designed using the latest JS and CSS frameworks which enhance the design efficiently. The basic templates are in HTML format which is widely used, but if customer demands customizations are made and the templates can also be made in WordPress version which is highly functional. Besides being highly responsive, the templates come with the greater ability to work smoothly on a variety of devices. This indicates that the template is designed to change its design automatically according to the screen and device you are using. From homepage to dropdown navigation it all depends on the customer’s requirements and there are two options which customer can choose as per their needs. 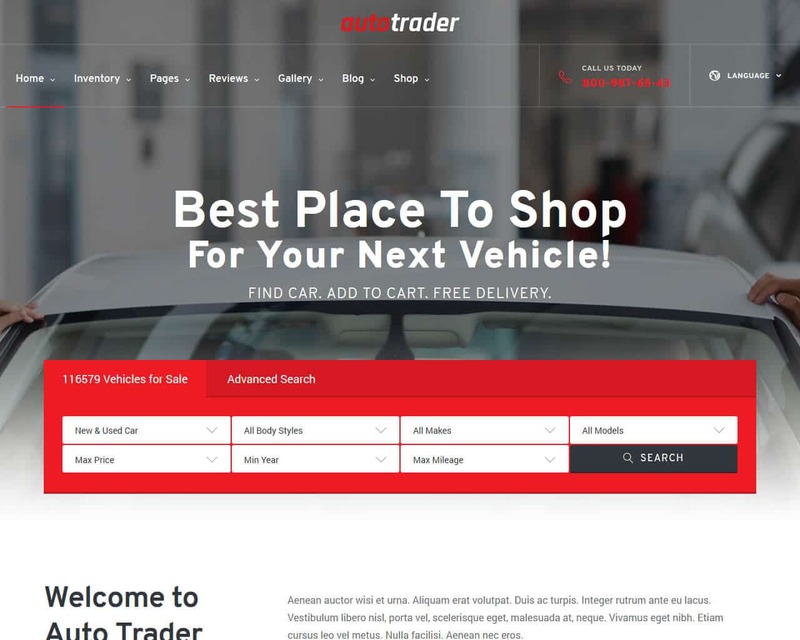 AutoTrader is the multipurpose automotive and car dealer website template that comes with several pre-defined demos and color schemes and there are many variations to choose from. Therefore you can add multiple HTML pages as the options are endless. These templates not just only perform a variety of tweaks, but also enable the users to create customized website look without any hitches. If this is just a basic thing for you, then wait till you experience all the features of AutoTrader. Extreme performance, highly customizable, mobile ready and search engine optimization and easy to use, AutoTrader templates are there for all users. 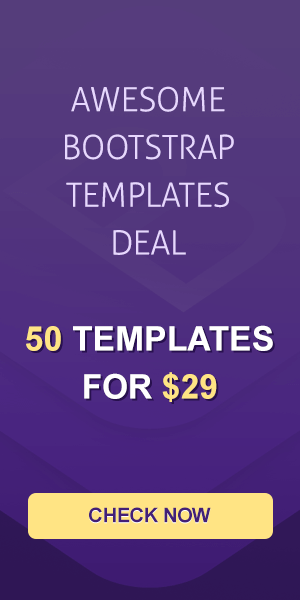 Mega menu, multiple header styles, comfortable navigation along with on scroll effects and animated statistics, the templates come with complete AutoTrader package. It has a neat and clean layout and the features outstanding and all the codes are of highest standard that you need to for designing a high quality website for your automotive services. 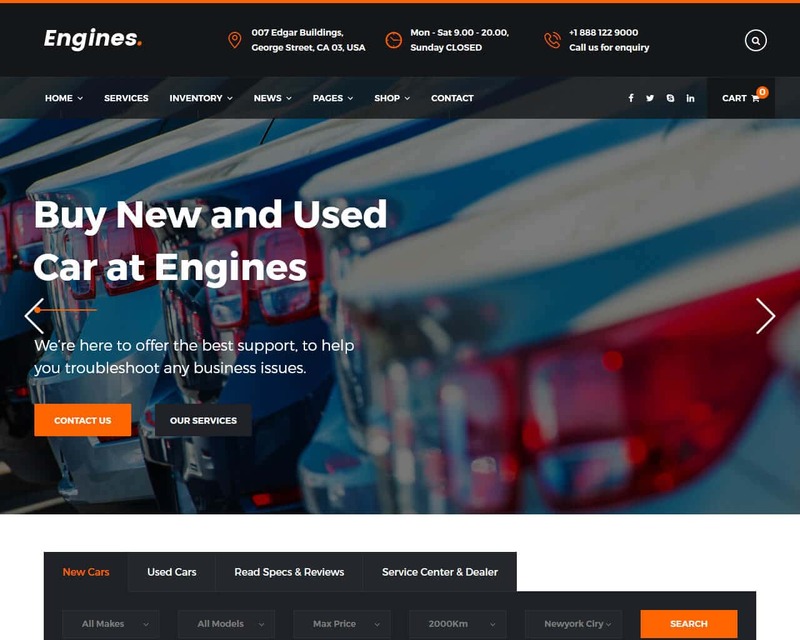 Engines is the highly responsive and standard car dealer, motor cars and automotive site template that is designed for those involved in car or automotive industry. The template comprises of all the features and characteristics required for designing a high quality, responsive website for your car services. The homepage of the template comprises of detailed layout which would definitely fit any motor cars, automotive and vehicle dealership business website. 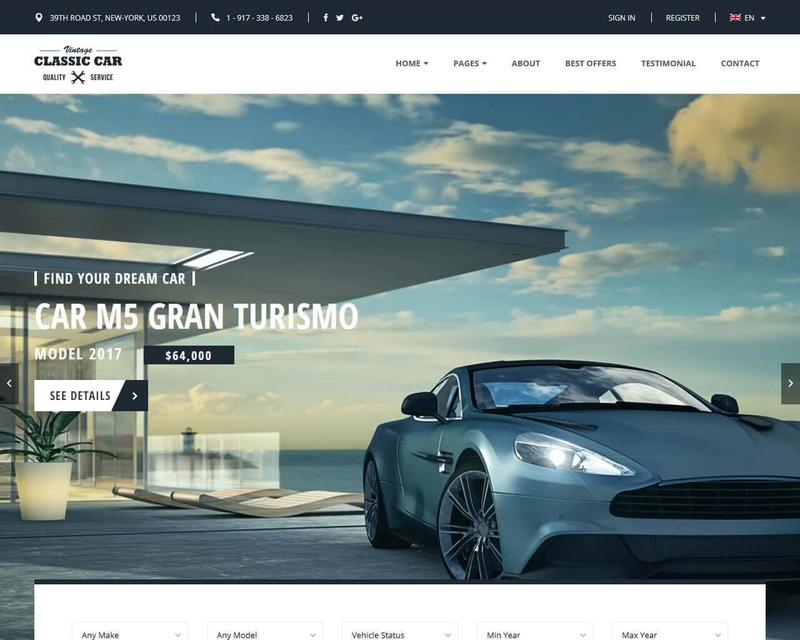 If you are planning to design a website for your vehicle dealership business, automotive dealer or motor car business, then you will find this template quite effective and useful. 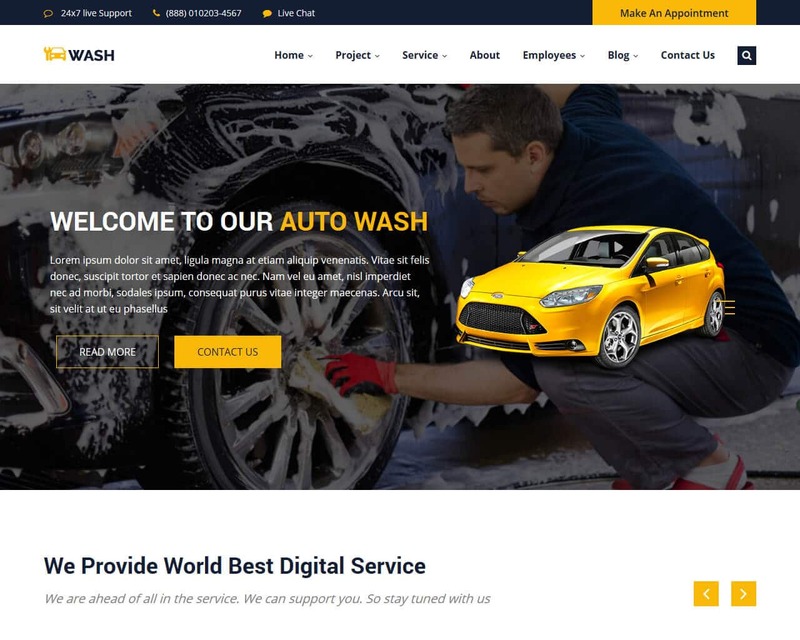 As the name suggest, AutoWash is the automotive wash website template that is really very useful as it allows you to make use of it for any kind of car servicing. The template is highly customizable that would fit any business needs. AutoWash make use of best framework to design the template and it makes the template highly responsive as well as simple and even maintaining and managing of the template becomes easier. Designing a website for your car wash business is really a breeze with the use of AutoWash templates. The templates have two index pages that are ready to benefit you along with its other 14 pages. AutoWash templates are mobile friendly and pixel perfect and design of the template would work perfectly on any mobile devices. Its clean coding and the search engine optimization benefit of the templates would help your business to reach more targeted customers. 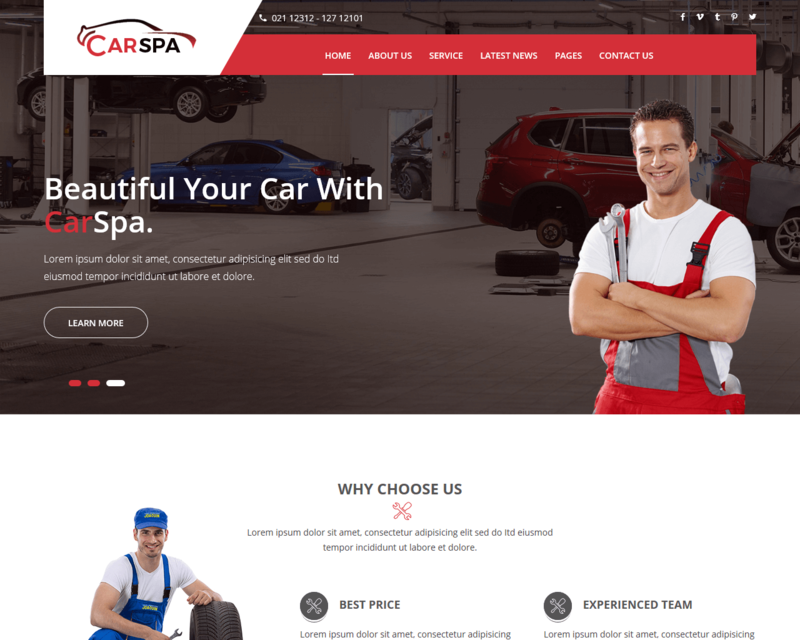 If you are into car service industry and planning to design highly responsive and captivating website for your business, you would require a tasteful and pretty good template for the same. Car Club is the highly responsive website template for businesses that are into car businesses. This template would give your business website a higher quality look with elegant theme schemes and color options. In a bid to make your business website highly responsive, it uses the latest and most advanced framework and it is also designed by keeping the needs of mobile customers. So, the template would run both on desktop as well as on mobile devices without hitch. The template comes with innovative layout for the car lover clubs and community and the template can be customized to include every component required to suit the idea of your business. 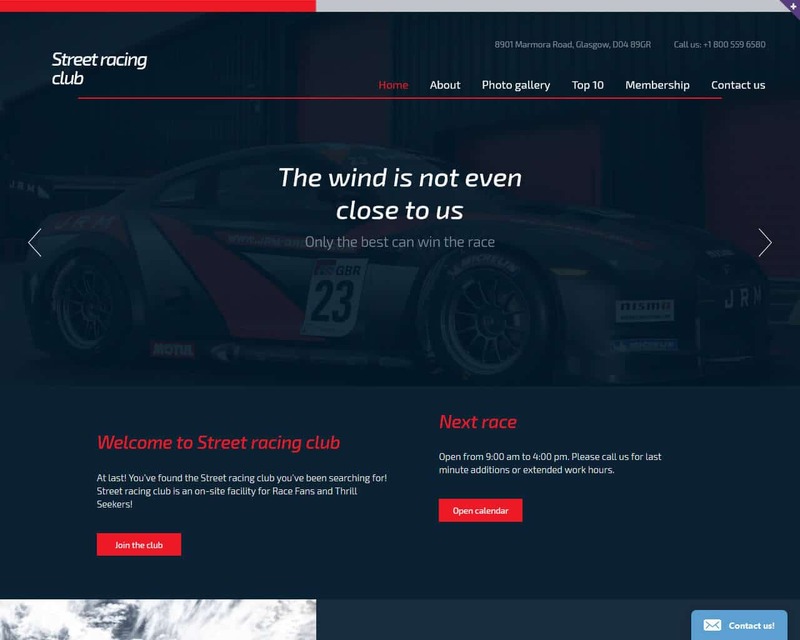 So give try to this innovative template and have an organized layout for your car club website. In a bid to inspire the internet users to convert into your potential client, you need to have a website that is created with the modern day auto website template. This is where Car Scarp template excels. This is highly responsive website template designed exclusively for the businesses that are into car scarp business. 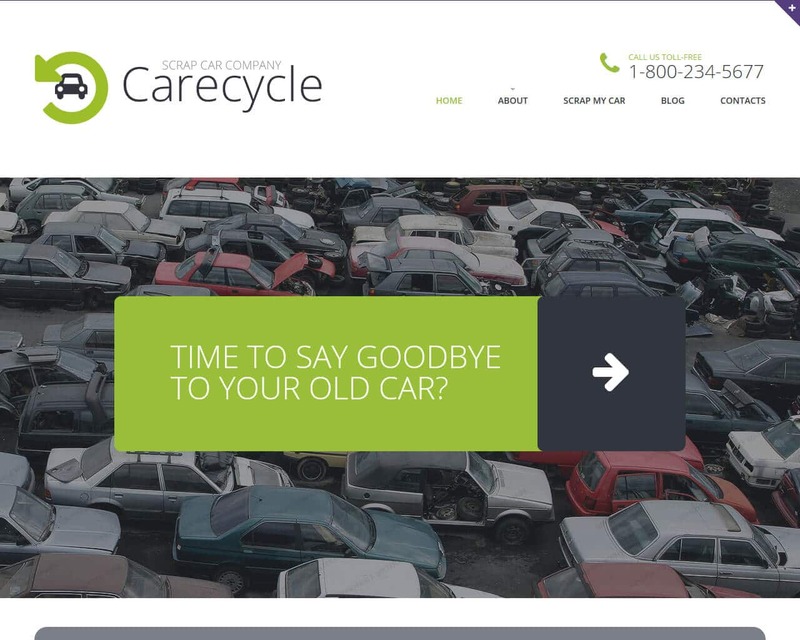 This is the laconic, fresh and modern-day template that is customizable for business that is into auto junkyard businesses. Car Scrap template can also be used for a variety of other personal projects involving cars. The template is designed by keeping the needs of modern customers and it is coded with the valid HTML and CSS practices. With the use of this template you can keep your website design well organized and you can expect to get 24/7 technical support and guidance from the technical team online. So, get the template design and allow it to function for your company promotion. 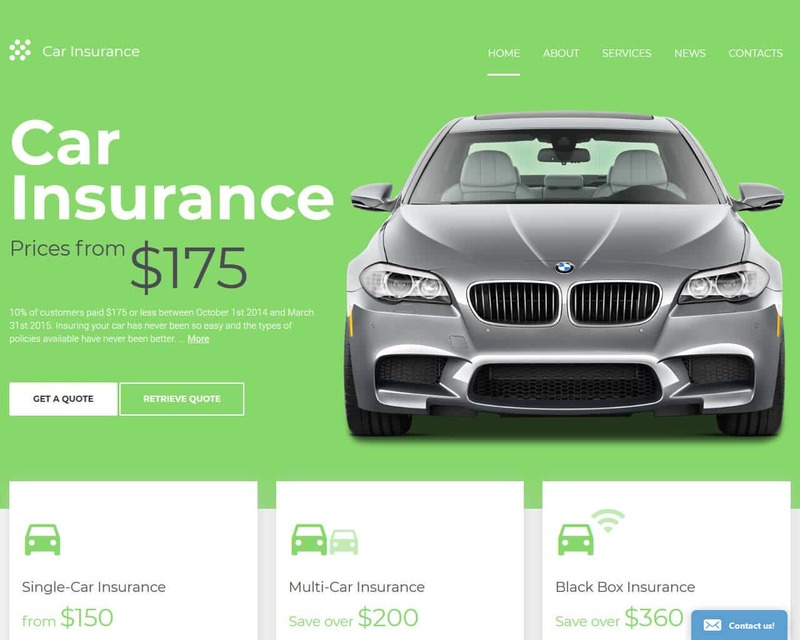 Car Insurance is the highly responsive, beautiful website template that is designed specifically for the businesses that are into car insurance. This website template is logical and technologically advance and the design of the template is functional and highly responsive. Since the template is designed using the best HTML practices, the website is likely to adapt quickly to any gadget, regardless of the size of the screen. The images of the template are also flexible and the texts are also re-coded automatically to display correctly. This will enhance the visitor number to the website and also the conversion rate. The template comes with built-in menu that sticks to the top of the design and you can customize it with options and the main navigation menu is right before the user’s eye. From contact form to font icons, CrossBrowser, Google Maps to valid semantic coding, every feature is includes in the template to make it a useful theme for your website. If you into car wash business and looking forward to take your business online, then a captivating website is needed and CleanMotor is the pre-design template that satisfy your website designing needs. 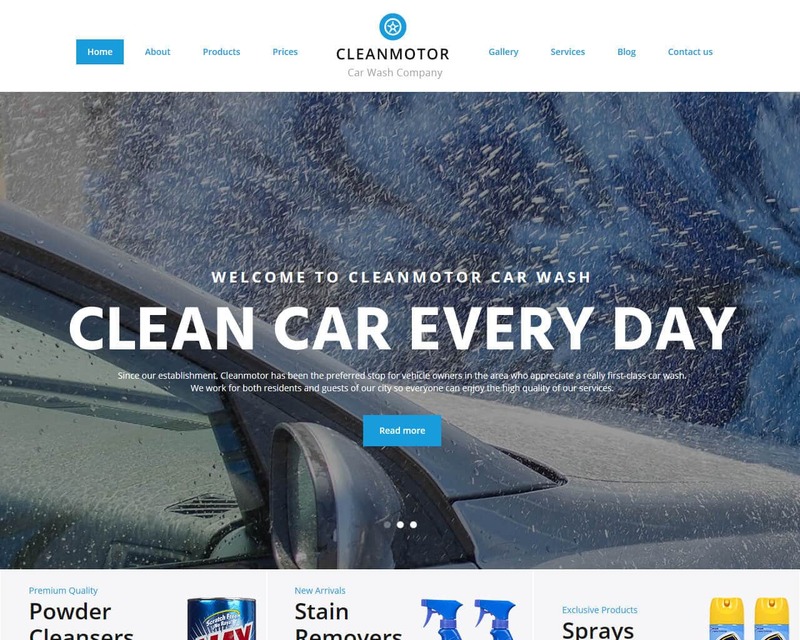 CleanMotor is the car wash company template that is designed with most advanced and resourceful design framework that allows you to showcase the car waxing business in the best way possible to the online users. From professionally designed About Us page to navigation page, everything is well designed and helps you to present the business with creativity. It allows you to add the previous customer testimonials that enable your new customers to know how reliable and quality services your company offer. The template has many pre-design HTML pages that save lot of your time and also enables you to present the details of your business in well-organized way. It has the advanced UI kit that allows you to enrich the information with different types of content. 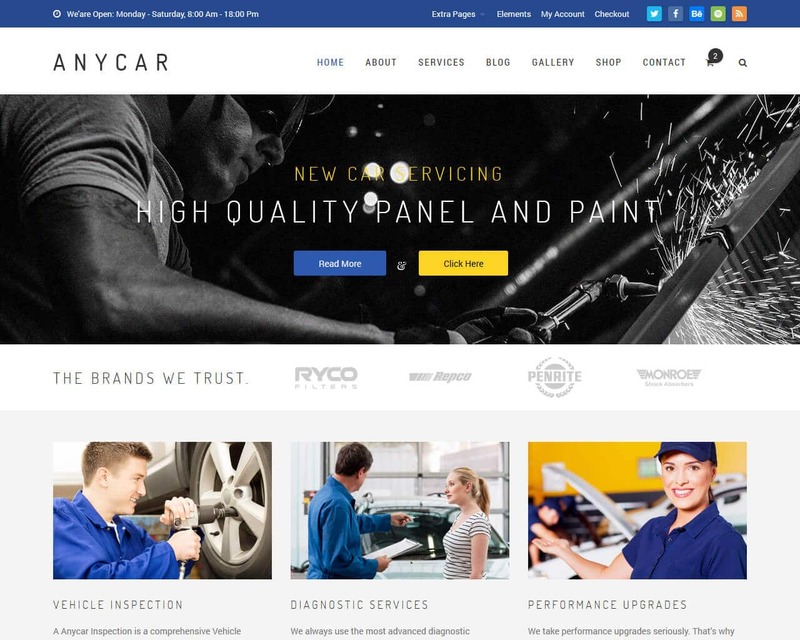 With the highly responsive automotive website template like Car Repair you are no longer required to worry about the business page. This is the website template that comes with potential to convert the visitors into client with its HTML template design and many great options. It is the design that encourages the visitors to fill up the request form and likely to get converted with its usual hero images and design. This template design has all the quintessential elements and components that are required for a professional website for car industry. 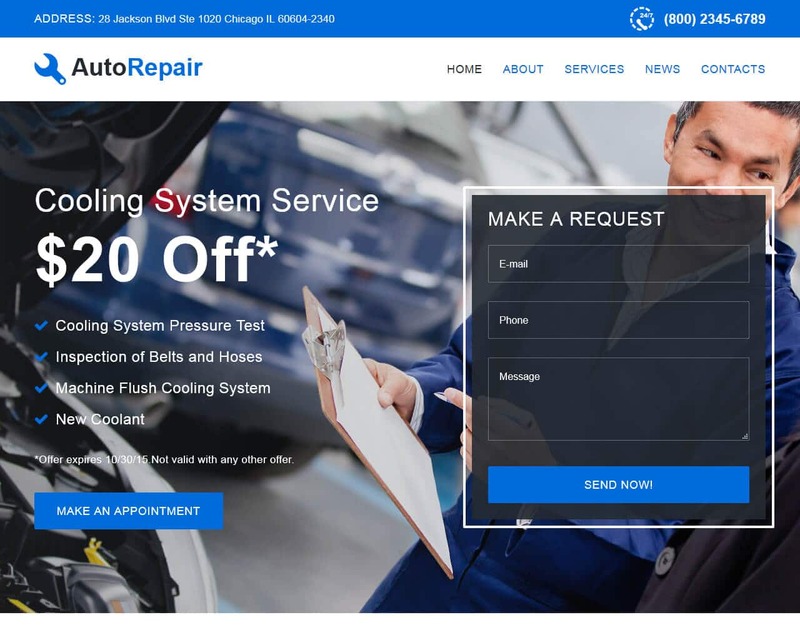 From compelling webpage to home page, about us to several other service page, this template has many such features that you need for your Car Repair service website. It allows you to add coupon pages as well and even you can list main features and display the present accouchements and the service section to divide the audience into small groups. 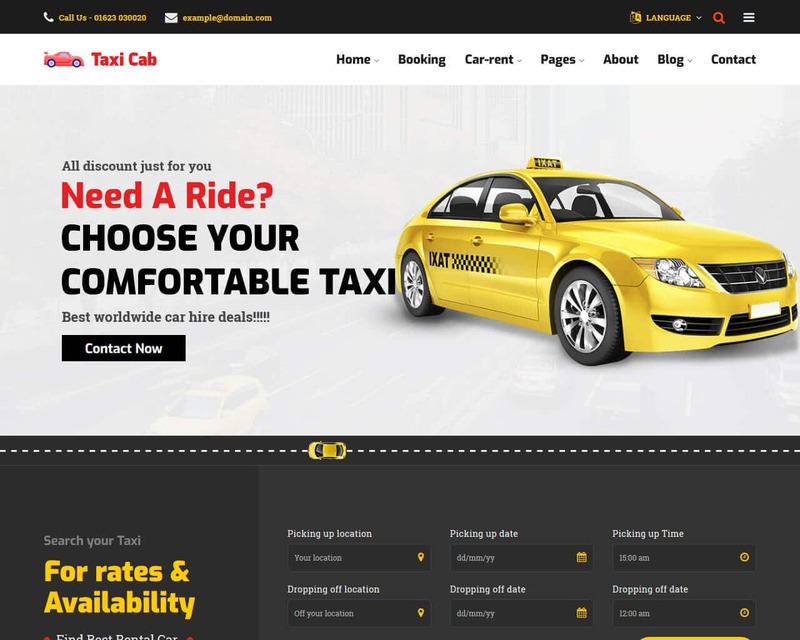 CarRent is the modern-day and advanced HTML5 template that is created mainly for Taxi, Boat, Transport and Ambulance and other cars that are available sell services and rent. This website template is highly customizable and it is SEO optimized too. Since it full optimized and responsive it works smoothly on varied devices without hitch. CarRent is the best SEO template design that is created mainly for online car rental service providers and it promises to help the business owners to advertise and promote their services and customers may find its features quite helpful while hiring or booking a cab online. The files structure is full optimized and prepared so as to make the editing easier for the users and the template is design keeping the needs of today’s customers and the design is based on responsive layout. It comes with 10 Homepage variation and additional 10 pages for your help. 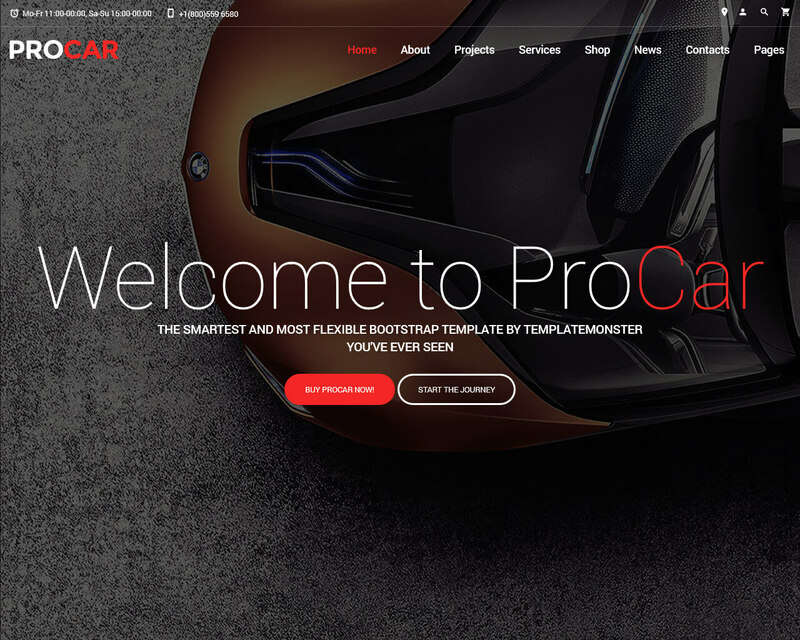 ProCar is the clean design, highly responsive, and Multipage HTML website template that is designed mainly for the businesses that are into car parts and servicing. The template comes with outstanding pay layouts that offer you with right solution for the cool HTML5 websites. It is for the businesses that deal in car accessories and parts along with blogging supports. With the use of this template you can also create your own appealing website and this is the template that allows you to include information and add aesthetic value to the website. ProCar template comes with built-in widgets and shortcodes which allow you to include the social profile in the website. From interactive elements to add-ons, buttons, info graphic, blod posts and other elements all can be added into this template for your convenience.There is helpful navigation in the template and other headers which would make it a best solution for car related website designing. 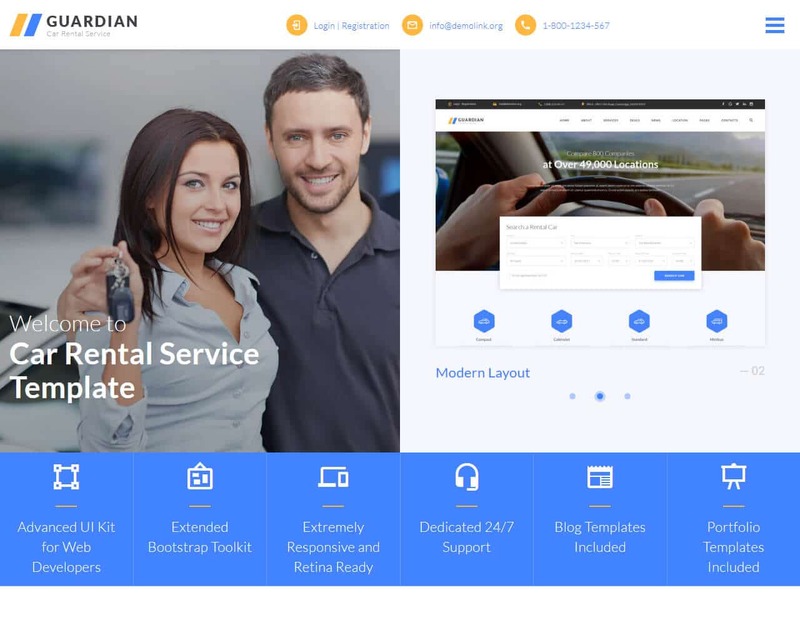 For both experienced website developers and beginners, Guardian is the best multipage HTML template that is designed mainly for the car rental companies. The best part of this template is that it requires no coding skills for installation and maintenance and it comes with advanced UI kit that is higher professional and used by experienced developers. The template also comes with built-in gallery, portfolio and blogs which are the part of the template package. Moreover, the template is customizable that allows you to include other options to enhance the overall appearance of the website. The template also comes with impressive slider which is located right on top of the page and you can also add different animation effects to make your website look updated and responsive. The responsive design of the template also allows you to add images to keep the website sharp and beautiful. 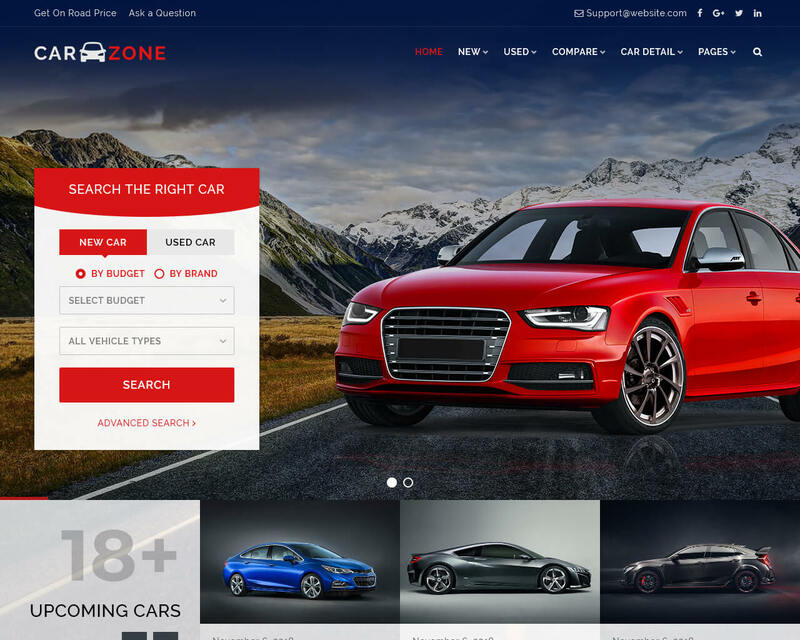 CarZone is the advanced, clean and intuitive template design for car dealers, second hand car portal, car portal, car specification portals, and compare car websites and more. It is the responsive template design that is designed using the advanced framework and best HTML practices. It is the readymade Wire-Frame that supports the HTML files and comes with all elements and required pages for website designing. The prime highlight of the template is that when you start checking it you will start loving its design and every page is unique designed with perfection holding the uniqueness and attractiveness of the designs. The best part is that CarZone smoothly works on all mobile devices and tablets and its highly responsive features are perfect even for smaller screens. Besides the homepage, all other pages are unique and different and its business oriented design is perfectly showcased with the page title and description. AutoCar is the best and intuitive used car website template that is suitable for all online free cars ads website. The template is fully responsive and wonderful to view on the responsive mode with its captivating features. The template uses multiple pages and color schemes to give your website the most professional look. The template has many great uses with lots of styles of posts. AutoCar is the best template for those who are looking for professional and minimal looking template designs. From 100% support from the team to usages of the template for web designing, you will find this template quite helpful and the right solution for your common website designing needs. The template is customizable that allows you to customize the template and its design to suit your web designing needs. Moreover, it comes with 2 homepage styles and 20+ HTML pages and the template is already tested on real devices. Accelerator is professional grade responsive HTML template that is designed for car dealers and vehicle marketplace. The theme and template design is perfect for car dealers and auto motor retailers. Regardless of the size of the business, it allows you to manage the website completely by setting the complete automotive website with ease using its Automobile HTML template. The template is highly responsive and designed with the advanced and latest themes and designs. Moreover, the best HTML practices are used to design this template for your webs designing needs. Accelerator is the template that comes with 20+HTML home pages and it has multiple homepage design to suit your unique needs. Moreover, the template easy to use navigation bat and dropdown menu options that make it the number one choice for the developers who need highly intuitive template design for your car business website. AnyCar is reliable and highly used pre-made HTML template that is enriched with many good features and elements. It is the multipurpose layout design that is dedicated mainly for car business, automotive industry, repair service and mechanic website. The template is designed using the super flexible framework and this template is highly responsive that enables the users to setup their own webpage including some of the great features like the varied header with 4+ styles. This template comes with 8+ homepage examples and designed along with 3+ gallery styles to suit your needs. The template is mobile friendly and can be used on any device regardless of their screen size. The template design can easily adapt to the size of the mobile screen all images and texts are displayed accordingly. 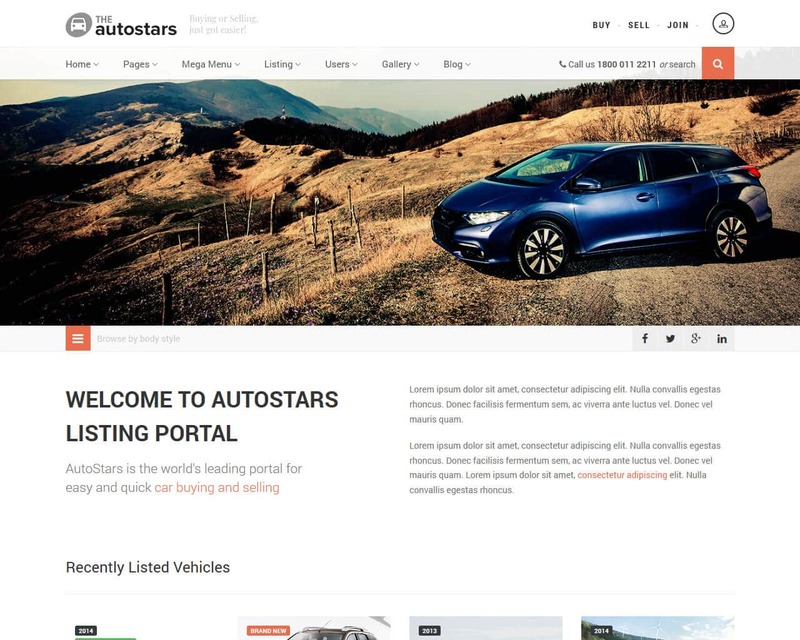 AutoStars is highly functional and responsive HTML5 template design that is developed mainly for the car dealership websites, vehicle listing business, and it comes with hand full of elements and designs to suit the needs of a corporate business website as well. The template is very useful as it comprises all the themes and styles that are helpful for optimizing a website and it comes with all the navigation elements and features that can be used for designing a website. The website is designed using the latest and best HTML practices and it comes with multiple homepage designs and has many color schemes as well. You will find this template really very useful and it makes your website highly intuitive for the internet users. 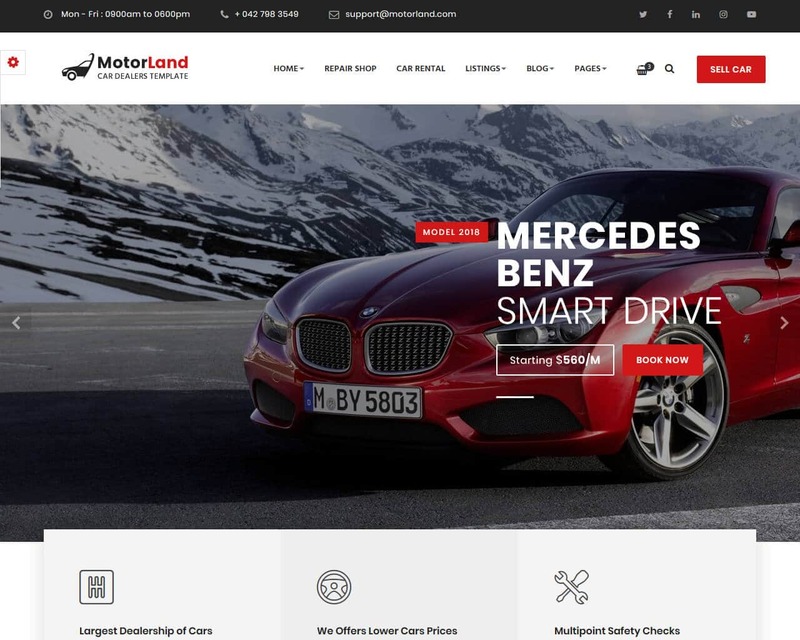 Motorland is simple, yet effective automotive website template that helps you creates pages for your car renting, dealerships and auto accessories business. It comes with the elements and great features which can be used to get the exact design you are expecting. It comes with some cool features and kits that can help you design creative and captivating websites. It can be optimized greatly and the looks can be adjusted with ease. You can observe the simplicity of the template in its design and it is designed using the best HTML practices and has multiple customizable options that can give your website a professional look. After using the full potential of the template you can achieve success with your website. It is not hard for you to achieve success if you make use of this tempting template for designing your business website. 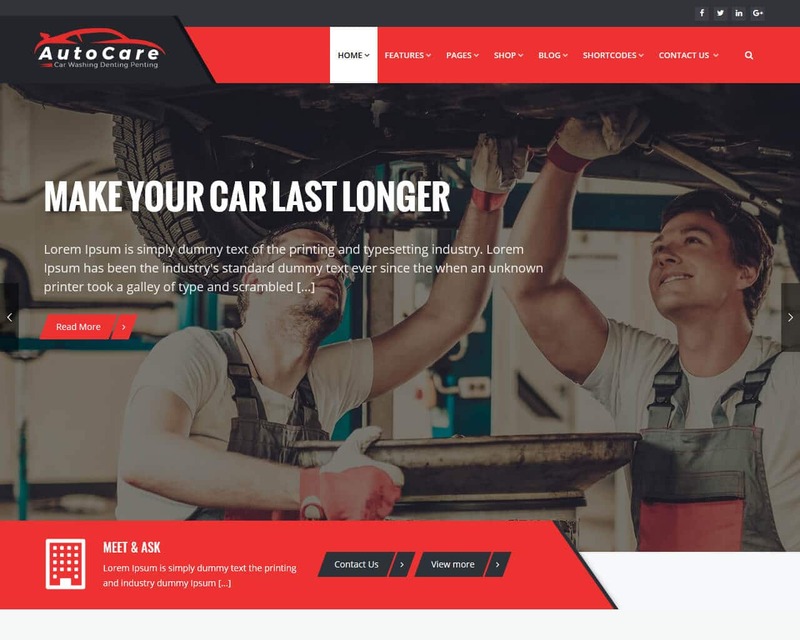 Modern and exactly to the point automotive template AutoCare comes with three diverse homepage for three different businesses. It is the clean and customizable template which can be used for car dent, car wash and general car service businesses and keeping these three businesses in mind the template is designed. However, the template can also be used for other business purposes which include selling car accessories with blogging support and more. The template comes with at least 12 headers with size footer styles and crucial pages to complete the entire website design. Slider revolution, parallax and other animations, contact forms, appointment forms and more can be included as well in the template design with its customized options.